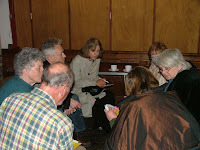 This is part 2 of the report of our first public meeting. Click here for part 1. So the next exercise was for people to write on their post-its what they thought the community, rather than individuals alone, could do. Freecycle came up again and again. For those who don’t know, this is an email group where people can post messages either offering belongings for free, which they might otherwise throw away, or appealing for specific items they need which others might not be using. The Greenwich Freecycle group can be found by clicking here. Thanks for those. Accessing grants is certainly a possibility as we develop - it would be great to be able to distribute cash to local projects that fit in with transition principles. 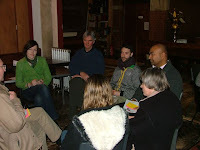 There will certainly be more transition meetings - click here for the next one. And we are trying to keep the fantastic Westcombe News up to date with everything we are doing. The idea above about developing a skills database of local transitioners is also worth doing - but requires some thought and planning about how to go about it and make best use of it. “Ask local councillors if they have plans of action.” This is an interesting one – if people feel strongly enough that the council should be aware of peak oil and acting to prepare for it, would it be worth arranging a co-ordinated lobbying of councillors and pointing them to examples of local government elsewhere that are doing so? Something to consider. Unfortunately our local ward councillors weren't able to come along - week nights are probably not great for them with other meetings to attend - but we hope to see them at future events if possible. Talking of which… Feel free to come along to our next public event (also free), on Wednesday 8 April in Mycenae House, Mycenae Road. We’re calling it a Brainwave Bazaar, and it’s a chance for some of the kernels of project ideas above – or completely different ones we haven’t heard yet – start to take shape. There’s more information by clicking here. Do spread the word to friends, neighbours or organizations or existing projects and groups you think would be interested. 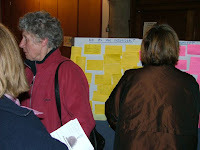 To finish, here are some of your comments about our film screening event. Thanks for the kind words, and thanks for taking part so enthusiastically. There were a couple of questions posed, too, which we’ll try to answer soon. www.Bigwardrobe.com is the Internet's biggest clothes swapping website. There's currently loads of fab stuff to swap... inc. a gorgeous pair of Louboutin peep toes - for FREE. Have a sneaky peek at: http://www.bigwardrobe.com. Got an idea for community food-growing?